A great pair of shakers for your cabin decor. 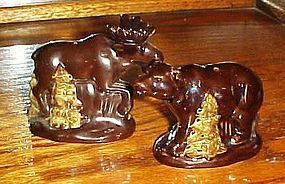 Moose and bear ceramic salt and pepper shakers with a nice brown glaze. Measures 3 1/4" tall and is like new with original stoppers.